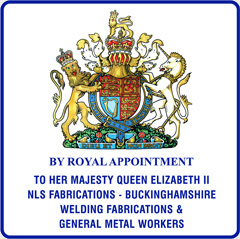 Roy Poulter and NLS Fabrication was awarded the Royal Warrant in 2000. It is granted for 5 years and we have just had our 3rd term approved. The Royal Warrant is awarded in recognition of hard work and loyal service to the crown. NLS is featured in the book a Peerage for the Trade produced by the Royal Warrant Holders Association which details companies that bear the Royal Warrant. We were one of the companies chosen by the Warrant Holders Association to feature on the BBC production Inside Out. The book itself traces the warrant from merchant times to the present day and was written to commemorate HM the Queen's Golden Jubilee.